Why use Herbal Y Extreme? This potent natural formulation is specifically designed to enhance men’s sexual performance and improve stamina. Horny goat weed (Epimedium sagittatum), has a long history of use in Chinese medicine, where it is known as an aphrodisiac and fatigue reliever. Damiana is an acclaimed aphrodisiac, while Siberian and Korean ginsengs assist stamina and energy levels. Adults: Take one tablet daily after food, or as directed by your healthcare professional. FOR MEN ONLY. If symptoms persist consult a healthcare professional. Vitamin supplements should not replace a balanced diet. Buy Nutralife Herbal Y Extreme Tablets from Fitness Market and save! With our efficient dispatching and quick delivery throughout Australia, Nutralife Herbal Y Extreme Tablets can be yours sooner. 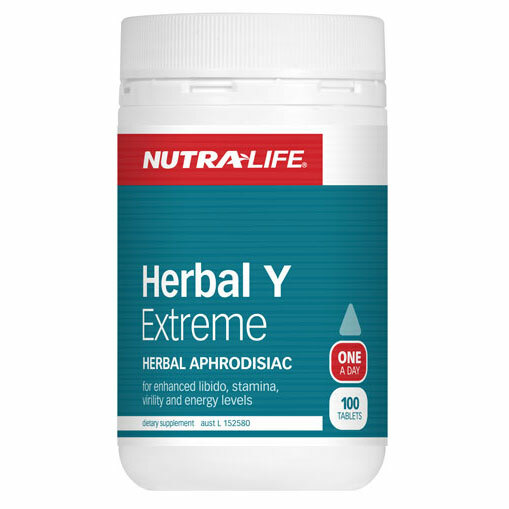 Below you can rate and add reviews for Nutralife Herbal Y Extreme Tablets. I've been using Herbal Y Extreme for 3 yrs, I've found it really does work, increases your libido and encourages weight loss and muscle gain! I really notice it when I'm not taking them definitely helps to make you feel younger.